By supporting the grandmothers you are supporting the orphans who are living with us. As a grandmother, I will make sure that before I sleep, everyone has eaten, and everyone has actually been taken care of. All of them. The declaration above from Thulisile Dladla, Swaziland, was only a part of her report on what life is like for the grandmothers of subSaharan Africa who are given support by the Stephen Lewis Foundation. 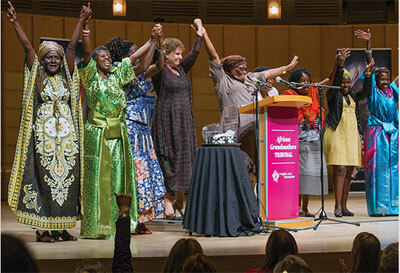 The Tribunal in Vancouver in September gave a forum for six grandmothers to tell their stories. Their stories, along with the resolutions toward action of the panel of judges, have just been circulated in a special Fall 2013 edition of the Grassroots newsletter, available online. (Click here.) The newsletter makes fascinating and moving reading, and it reminds us of why our fundraising in Oceanside, far removed from the lives of the African grandmothers, is truly worthwhile. Friends, Judges, and Grandmothers: We have heard your voices and I know all of us feel the searing sting of injustice, the agony of loss, and the profound determination, strength and love that you have brought to meet the ravages of AIDS in your families and communities. The tenacity and intelligence of your responses to the scourge of AIDS are breathtaking, and we could not be prouder in this moment to stand here with you as witnesses and passionate allies in the struggle. This entry was posted in news by oceansideg2g. Bookmark the permalink.